When you first visit Catawba Island you probably won't think you're on an island. But by the strictest sense of the definition, Catawba is an island surrounded by water on all sides. Founded in 1861, Catawba Island is home to more than 3,100 people, but many more visit each year. Miles of beautiful shorelines, great fishing, nature reserves and state parks make Catawba Island a summertime paradise for many in Ohio's North Coast region and beyond. Catawba Island is like a big playground for kids and adults, with a long shoreline. You can enter Catawba Island from SR 53 exit off of SR 2 or Sand Road off of SR 2. Both meet each other at Catawba Point, in a loop around the penninsula. On land, motorcycles, bicycles, cars, golf carts, walking and running are popular. On the water, about every form of transportation is available for rent. The first settlers came to what is now Catawba Island in 1835. There were 3 families and 3 single men that cleared the land, built log cabins for their homes, farmed the land and fished. As more people came, more land was cleared and fruit became the principal crop raised along with feed for their stock and gardens for their own use. Steamers came to the end of the Island to haul away the fruit and produce and also provided transportation for the residents. Grape growing became an important part of Catawba’s economy when Nicholas Longworth, of Cincinnati, brought the first Catawba Grape vines there from North Carolina. 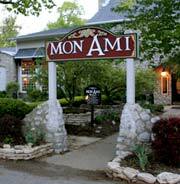 The Mon Ami Winery was built in 1871, and has had many owners. Norman Mantey converted the first floor of the winery to a restaurant, which he called The Mon Ami Champagne Company and is still operating today. Apple and peach orchards were started commercially in the 1870’s and still produce some of the finest fruit available anywhere. 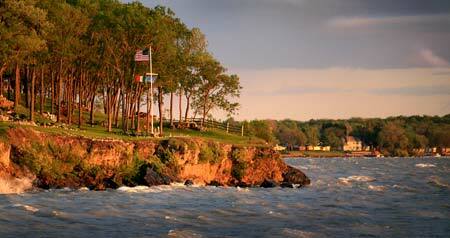 Catawba Island State Park, located in Ottawa Co. about 10 mi. 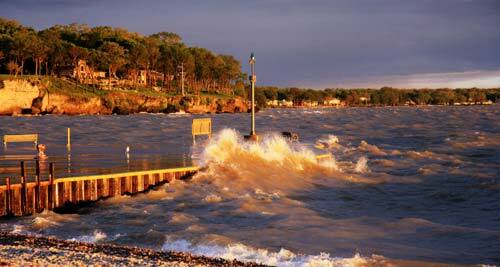 E of Port Clinton, is the last stop on the mainland Ohio shoreline before Lake Erie waters stretch to South Bass Island. This day-use park is also the main headquarters for Kelleys Island, South Bass Island, Middle Bass Island and Oak Point State Parks. The Mon Ami Restaurant and Historic Winery is one of the oldest wineries in the Lake Erie Islands region. The winery is of further significance as one of the four large co-operative wineries which played an important role in the development of the region's wine industry. The Catawba Island wine co-operative, the Catawba Island Wine Company, constructed the winery building that is today's Mon Ami Restaurant and Historic Winery. The Catawba Island Wine Company was founded by a number of Catawba Island grape growers. In 1937 the winery was acquired by the Mon Ami Champagne Company. Mon Ami had been founded in Sandusky shortly after the repeal of the 18th Amendment and was one of only a handful of wineries in the United States specializing in the manufacture of domestic champagnes at that time. During 1937 the company moved its equipment from Sandusky to Catawba where it employed fifty-five men in the production of up to 400,000 to 500,000 bottles of Champagne, burgundy, and still wines a year.